And the new games keep coming along with more restocks! Coimbra in the newest game from Plan B Games who also did Azul, Century Spice Road, Century Golem, and Century Eastern Wonders. 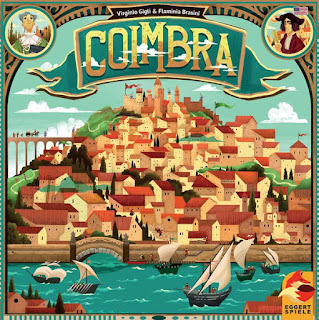 Coimbra is a dice drafting, point salad extravaganza of a game that introduces a unique dice mechanism. On every round, the dice players draft will be utilized in multiple ways, first as the number and later as the color. There are many ways to win. Whether you focus on increasing your coin income, hiring new guards, promoting academic progress, deepening relationships with surrounding monasteries, or providing the voyages of discovery of this era, in the end, only the one who sees the most promising synergies will succeed and know how to use it. 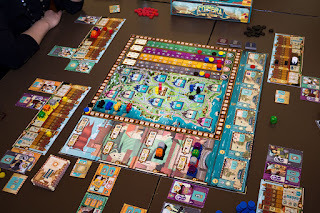 In addition, the innovative cube-inserting mechanism guarantees a high-tension struggle for the most helpful inhabitants of Coimbra, as the choice of each cube affects not only the order of turns and the cost of bribery, but also their own income. 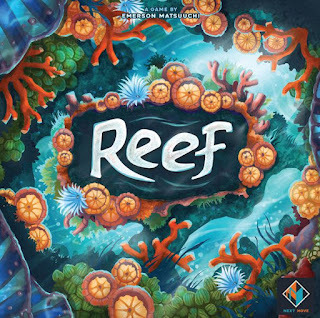 Reef was created by the game designer Emerson Matsuuchi, who did the Century series. During the game, players serve as the reef itself, alternating turns carefully selecting which colors and patterns in which to grow and expand - the more beautiful the reef, the more points they will score. 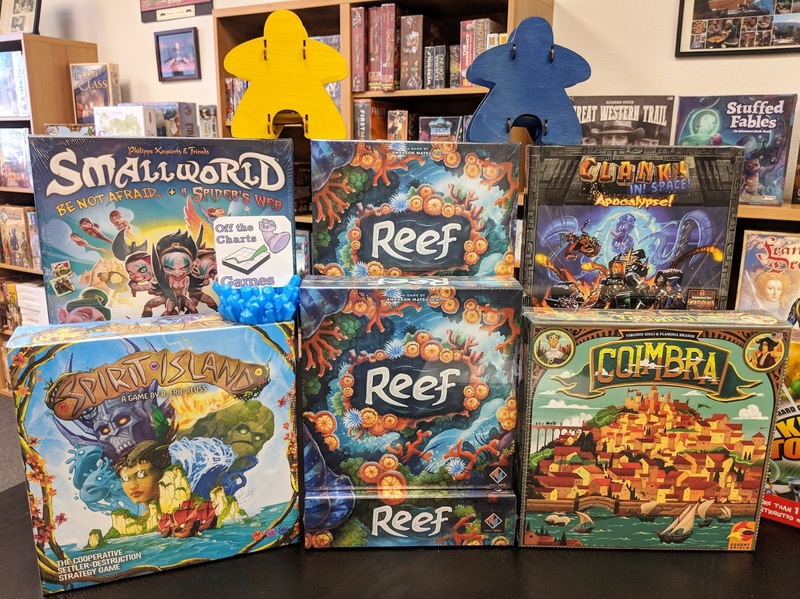 Reef is played over a series of rounds. On a turn players must perform one of two actions: A) play a card from their hand, place the indicated coral pieces on their board then score the indicated pattern if it appears on their board and as many of that pattern that exists at that time, and 2) simply draw a card to your hand.Coral pieces may be stacked up to 4 high but only the top exposed ones count. 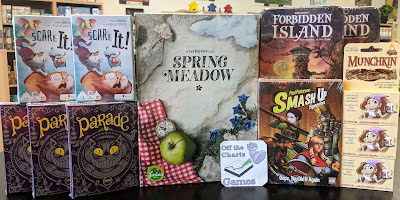 Spring Meadow is the third in Uwe Rosenbergs' trilogy puzzle board games (Indian Summer and Cottage Garden). 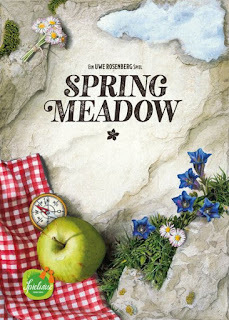 In Spring Meadow, Uwe has combined some elements from Cottage Garden and Indian Summer. Hiking pins are awarded by having the highest scoring meadow when a scoring round is triggered. Meadows are created by completely filing up rows on your individual mountain board with the grassy Tetris-like pieces. 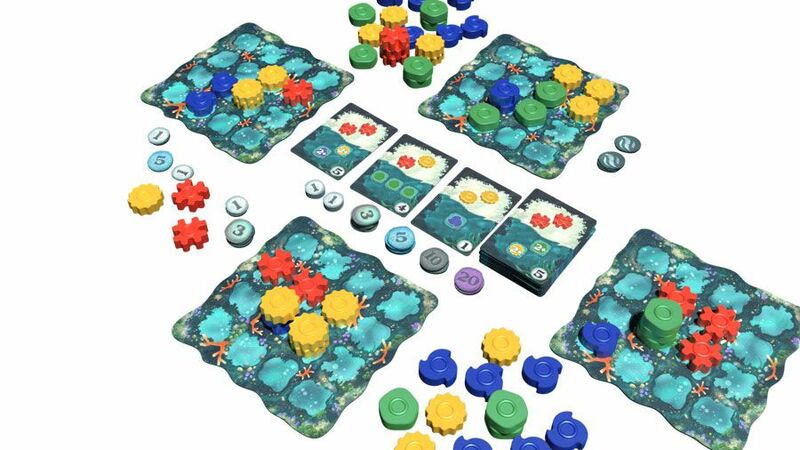 Starting at the grassy edge of your board, each completed row counts as 10 points. For each incomplete row above the completed row you'll score 1 point for each covered space. Each mountain board has a number of random marmot mounds. Marmot mounds that are covered with a grassy piece containing a hole to expose it also scores 1 point. Having open holes on your board serves two purposes. 1) they score points during a scoring round when they expose a marmot mound, and 2) grouping them adjacently gains you rock tiles that you can use to cover vacant spaces. If you are lucky enough to win a scoring round and receive a hiking pin you must then place a marmot token over each of your open marmot mounds that scored - these will not score in future rounds. 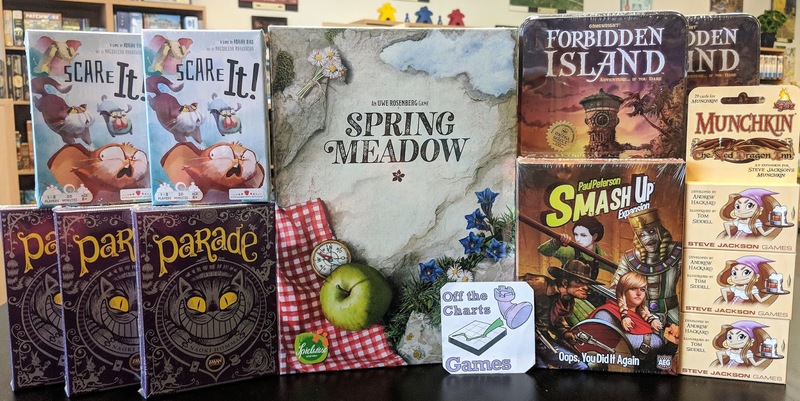 The first player to manage their meadows, marmots, and rocks well enough to win 2 hiking pins is the winner. Bring your beans to town at high noon. It is time duel in Bohnanza: The Duel. 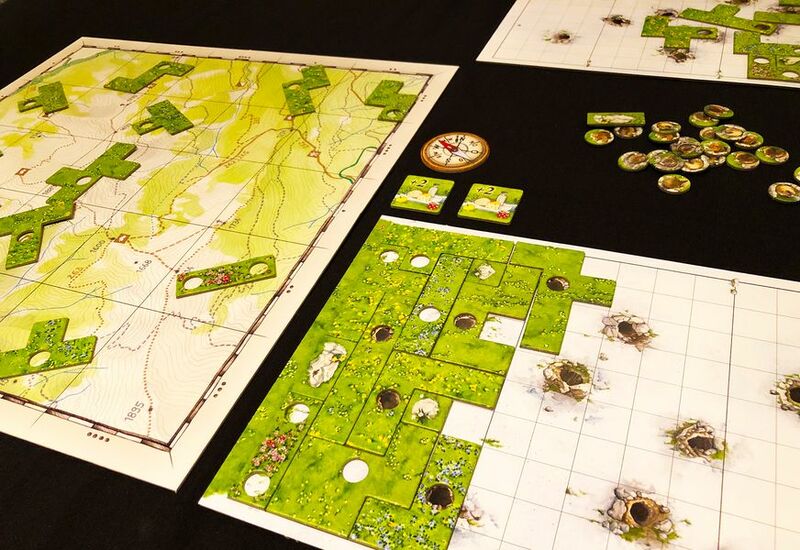 Each player has 3 bean fields to plant and harvest as well as 3 private objective planting cards. Plant the first card from your hand, then maybe a second. Turn over the top 3 cards of the bean deck. Offer one as a gift to your opponent. If it's refused they must offer a bean gift from their hand. Once the gifting is over, plant all beans gained into your fields. Note; the active player can discard one of the revealed beans drawn, but not the gifted card. Harvest any fields that you wish gaining coins for it's value and pennies if it meets an objective card. Conclude your turn by drawing 2 new bean cards up into your hand placing them at the back, and drawing new objective cards until you are back up to 3. 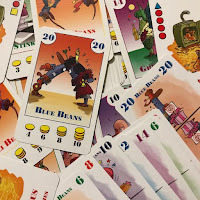 Bean cards are always played in the order in which they are dealt and drawn. Beans of different varieties can be planted in the same field. 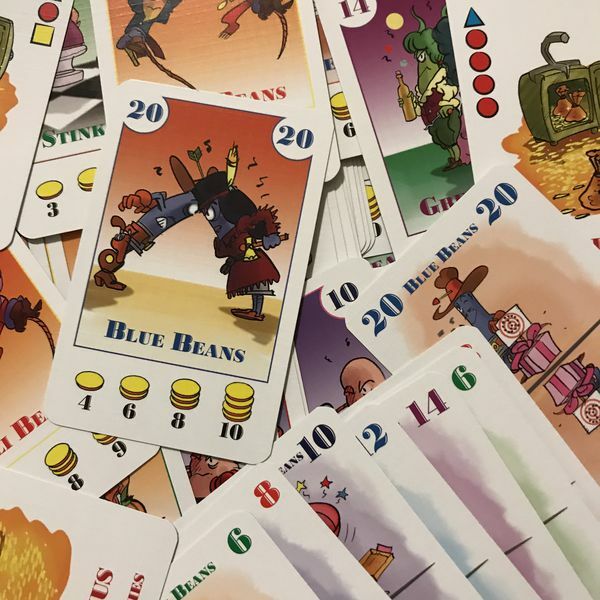 When harvested, coins are earned by counting the cards in a field and valuing them at the rate listed on the card of the bean last planted in that field. Additional pennies are earned for planting beans in exactly the right order in a field that meets the requirement on an objective card. Play continues until the bean deck is exhausted. The bean farmer with the most money wins. 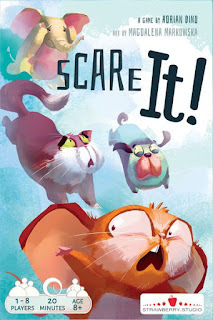 Scare It! 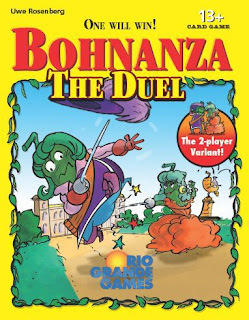 is a card game for the young at heart. The game consists of a deck of cards featuring 4 different animals. Elephants that scare dogs - Dogs that scare cats - Cats that scare mice -and- Mice that scare elephants. Set up a randomly dealt grid of animal cards 4 high and 8 across. Deal each player a color card and an animal card, kept secret. The object is to have the most points at the end. Points are awarded for each card of a color that matches your color card and 1 point for each animal that matches your animal. Now it is time to scare off those other animals. A turn is to pick a card to scare an adjacent card, i.e. pick that yellow cat to scare the adjacent purple mouse. Remove the mouse card and then choose to either slide the cat to the now empty space or leave it where is. Play until one column is empty or no legal scares are available. Score your points - most points wins. 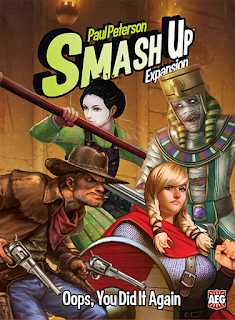 Oops, You Did It Again is the newest expansion to the base game Smash Up, the card game where each player smashes 2 weird factions together and tries to crush their opponents. New factions in Oops, You Did It Again include Vikings that bring the ability to steal cards and then use them, Ancient Egyptians that use their embalming talents to bury cards, Samuri that face their deaths with noble honor, and bonus effects, and Cowboys that call out an opponents' minion at high noon. Burying - allows you to hide cards face down in play until the right moment, to help you or hurt your opponent. Dueling - allows a minion to call out another, with various effects depending on the type of duel. 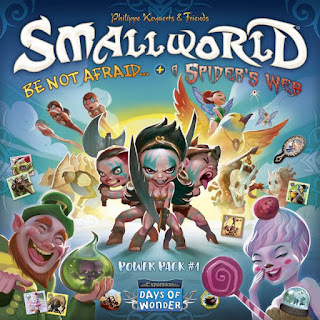 Small World Power Pack #1 combines all the races and special powers from the Be Not Afraid and A Spider's Web mini-expansions into one box with a storage tray. Requires the base game, Small World where players vie for conquest and control of a world that is simply too small to accommodate them all. Ever wonder what happens at the tavern after the adventure is over? 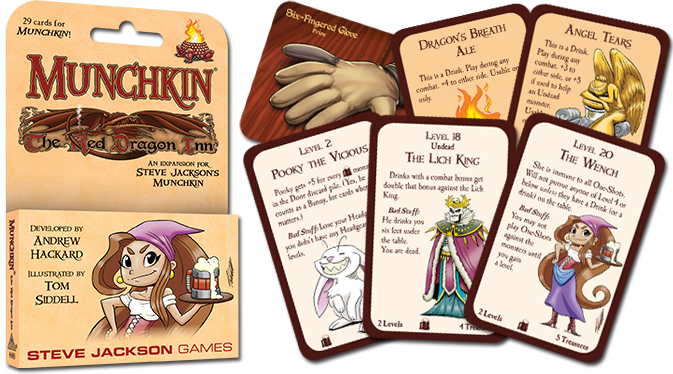 Now it can be told in Munchkin: The Red Dragon Inn. This Munchkin expansion pack includes popular cards taken from SlugFest Games' Red Dragon Inn card game. Grab fantastic treasures and enjoy exotic drinks. If you know what's good for you, be sure to tip The Wench. New in from Chessex are sets of solid metal polyhedral 7-die sets. We have Old Brass, Dark Metal, Copper, and Silver. Each set includes an eighth random nonmetal die.